This morning I drove all four of my boys to school in Engine 17. It's been about a month since we turned a wheel, so it was high time to get 17 out and run her around a bit. I had promised the boys I would eventually do it, and earlier this week we finally picked today as the big day. It was quite anticipated. Unsurprisingly, our arrival amongst the family sedans and minivans dropping off other students created a minor stir. Young children with mouths literally open, and double-takes from most everyone else. The two little boys in front were grinning widely as they got out, and the two oldest emerged from the jumpseats with style, and retrieved their backpacks from the compartments they had stored them in. Two parents approached us to ask about E17 (is this yours??) and look her over. 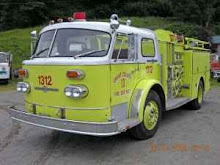 Fire Engine Envy. I commented on my personal Facebook status about this morning's event, and got some nice replies. One of them laughed and said "you are living your dream"! I guess I am. We have been very fortunate in so many ways. But, I don't think I was living my dream this morning as much as I was imposing my childhood dream on my own children. Not that they seem to mind. Judging by their faces: No problem, Dad! I returned later in the morning to retrieve the 3-year-old from preschool, and this time brought the 1-year-old. 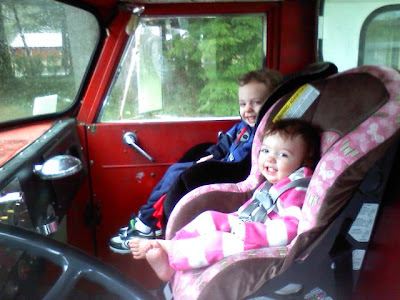 Two car seats strapped in the front of a fire engine cab are very amusing to behold, and brutally cute when their occupants are all smiles. Picked the rest of the boys up again at the end of the day, where the actions were repeated all over again. The 11-year-old got out there quick and made a show of standing on the running board while E17 idled and we waited for the other two. What a show off. Reminds me of myself. Here is the end of February...... looking forward to warmer weather and opportunities to do some work on the old girl. I LOVE it! This is absolutely awesome! I wish you had a picture of Jimmy on the running board. I love the happy faces of the little ones though. Thanks for sharing this! I'm sure the kids had just as much fun as you did! If you think you are the first person to put two car seats in the front of an antique engine......LOL!!!!!! At least you have some room in there! Oh, and if you happen to put them into my rig, when you go for reverse, you have to move (the occupant of the car seat next to you) their left leg first!!! !